The Society of St. Elpida was formed in March of 2000 by our Parish Council, with the sole purpose of identifying and responding to hardship situations in the Wilmington community, enhancing the community efforts to support our missionary Church, and assist those in need who are attending Holy Cross Seminary. St Elpida provides leadership in the Outreach effort of the Greek Orthodox Community of the Holy Trinity Church of Wilmington. Members at large are all the parishioners of the Holy Trinity Church, and the effort is guided by Fr. Costa Christo and a number of parishioners of the Holy Trinity who have been appointed directly by the Parish Council President to this task. The Society of St. Elpida is also cooperating and coordinating its activities with all the other Parish organizations, and invites all parishioners to become supporting members. St. Elpida supports the missionary effort of our Orthodox Christian Mission Center (OCMC), and especially the work of Fr. Luke Veronis, who is ministering to the spiritual needs of our Orthodox brethren in Albania. St. Elpida supports the work of the Greek Orthodox Metropolitan of Madagascar, Bishop Nektarios and assists him in his efforts to bring the Gospel of Christ, to the natives of this island who had never had such an opportunity. Bishop Nektarios in the last five years has converted to Orthodoxy 12,000 indigenous people, has ordained 10 priests and erected 10 Orthodox Churches. Helps people stricken by leprosy, provides food for the prisoners on Holidays, breakfast and milk to hungry children and through a infirmary which was constructed recently, provides medical help. 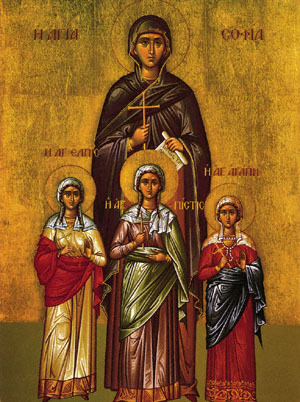 At the present time St. Elpida has assumed the support of two orphan children in Kenya and it is hoped with the help of all of our parishioners who will follow the example of St. Elpida, to increase the number of supported children in that country, where Orthodoxy is thriving. Your contribution of $20 per month guarantees daily food and housing for an Orthodox orphan child in the care of Metropolitan Seraphim of Kenya. The outreach message and efforts of the Holy Trinity Church have been received enthusiastically by our parishioners and several contributions have been made to help the work of St. Elpida. Your contributions, support and continue the benevolent work of your St. Elpida Society of Holy Trinity. Your quarterly church statement will reflect your charitable contribution. Please make your check payable to Holy Trinity Church, indicating that you designate it for St. Elpida. Fr. Chris and the Committee members of St. Elpida.